CVS Shoppers, if you LOVE Money Makers, this deal is for you. 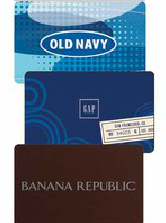 Right now, you can purchase a $100 Gift Card to Old Navy, Gap, Banana Republic or Piperline Store. In addition, to buying the $100 gift card, you'll receive $15 Extra Care Bucks (MONEY MAKER). If you're back to school shopping at one of these retail stores, this is an awesome deal! What a SUPER EASY way to make some money!